It was 1980 when a shy young kindergarten teacher first came to public attention as a rumoured girlfriend of Britain�s eminently eligible Prince of Wales. It sparked a media frenzy that never abated during the ensuing 17 years leading to her tragic and untimely death on a rainy August night in Paris. During that time she was �Shy Di,� �Lady Di,� �Diana, Princess of Wales,� a �People�s Princess� and �Queen of Hearts.� But before she was a princess, before the world knew her better than their next-door neighbour, she was just a girl from a British � albeit aristocratic � family, a girl who loved animals and swimming and dancing and mothering younger children, including her little brother, Charles. It�s that girl that her family wants to reclaim as their own and re-introduce to the world. Part of that effort is Diana, A Celebration, an exhibition based at the Spencers' 500-year-old ancestral home of Althorp House, an agricultural estate in the rural Northamptonshire countryside about 120 kilometres northwest of London. Some 2,500 visitors daily make pilgrimmages there throughout the summer months to explore the life of this extraordinary woman whose persona is etched into the tapestry of 20th-century history. Now that exhibition is making its second appearance outside England (the first was in Tokyo in 2002) in a showing at Toronto�s Design Exchange this winter. �One of the things that this exhibition does is to put (Diana) into context as somebody from a family, as a girl, as a person who turned into the figure that you all grew to know during her years as a princess,� Charles Spencer, now the 9th Earl Spencer, told a Toronto gathering in October as he announced the exhibit. Thus the 150 pieces displayed offer a picture, not only of the princess, but also of the humanitarian who worked tirelessly for charitable causes, the media celebrity who continuously set fashion trends, and the girl who was, first and foremost, a daughter, a sister, a mother, a friend. August 31, 1997 has become one of those defining moments in history. Thousands of people can recall exactly where they were and what they were doing when they heard the news of a car crash in a Paris autoroute tunnel that claimed the life of Diana, Princess of Wales. Her funeral, six days later at Westminster Abbey, was broadcast to more than 60 countries and an estimated 2.5 billion viewers. Stored at Althorp are more than 30,000 condolence books, containing over a million messages of sympathy. It�s the end of the story told in Diana, A Celebration, a true story of a woman who lived a remarkable life, a story of love and loss that easily surpasses the novels so eagerly devoured by young Diana, penned by her step-grandmother, �the queen of romance,� novelist Barbara Cartland. It�s a �powerful story,� says John Norman, president of Arts and Exhibitions International, who is working with Charles Spencer to bring the exhibit to North America. �It�s beautifully done because (what) the people saw was only one aspect of (Diana�s) life and it really helps to see her connection with her Spencer ancestors,� says Lisa Mitchell, of Toronto, a lifelong follower of Royalty and sometime writer for Canadian Monarchist News, the Monarchist League magazine, who has seen the display at Althorp. It�s also the story of a little girl who grew up to be a princess. Showcased are childhood letters written to her parents, toys, family picture albums, and rare home-movies filmed by her father, Johnnie Spencer, an enthusiastic amateur photographer and filmmaker. But much as the Spencers want the world to know Diana of Althorp, it�s impossible to ignore her celebrity or her impact on the world, its causes, its trends and even on the very monarchy itself. The story of the princess begins with the Royal Wedding on July 29, 1981, watched by over a billion people around the world. The centrepiece of this area is Diana�s wedding gown with its crinoline skirt, layers of flounces and record-breaking 25-foot train. 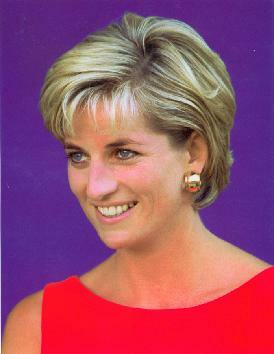 From her first official engagement in a controversial black strapless taffeta gown, by Elizabeth and David Emmanuel, who also designed her wedding dress, to later evening gowns by Gianni Versace to her informal Ralph Lauren denim shirts and Armani stretch jeans, worn during her landmines campaign in Angola and Bosnia in 1997, Diana defined the style of the late 20th century. Her support of the British fashion industry placed its traditions of classic tailoring for day and romantic evening wear in the international spotlight and skyrocketed unknown designers to stardom. The exhibit includes more than 20 dresses from the early eighties to her last public engagement, revealing through fashion and style her evolution from young girl to confident, mature woman. Diana once stated that she preferred to be thought of as a workhorse than a clothes horse and she used her style to draw attention to causes she was passionate about. Says her brother: �I think it�s important to remember that this is someone who could have done very little with her life except have a lot of pleasure and meet a lot of interesting people and have a lot of luxury, but she chose to take on deeply difficult causes� the landmines, HIV and AIDS, the lepers, the homeless people�. All profits are donated to the ongoing Diana Princess of Wales Memorial Fund, now headed by her sister Lady Sarah McCorquodale, which supports her causes. Proceeds from the Canadian show will go to Mines Action Canada, the Canadian affiliate of the International Campaign to Ban Landmines. In all, Diana, A Celebration does more than tell the story of her life, it explains her legacy, one that continues in the awareness of and support for her charities; in her children, one who will quite likely be King someday; and in the impact she had on a modern monarchy. Books about her life and death consistently top the best-seller charts � written by everyone from the journalists who covered her to the Scotland Yard officer who protected her to the spiritual healer to counselled her and the butler who became one of her closest confidants. The latter is again the public eye with A Royal Duty, his autobiography which hints at a conspiracy surrounding her death, and release of a letter in which she expressed fears that someone would kill her in a car crash. In an interview with The Toronto Star, Spencer downplayed the reports and criticized Burrell as an opportunist. Controversy of this type, and including recent news of scandal focusing on the Prince of Wales, are upsetting to Mitchell as well. What if that tragic night in Paris had not happened? What would the future have held for Diana? Would there have been a move to America, as Burrell�s book claims she was actively planning during that final summer, a new relationship, with Dodi Fayed or someone else? We will never know the answers. Fate intervened and, as Mitchell says, she �left on a high note, like a professional athlete going out at the top,� in a sense freeze framed at the height of celebrity. Diana of Althorp, Princess of Wales, and queen of people�s hearts left an indelible footprint on the lives and times of the 20th century.